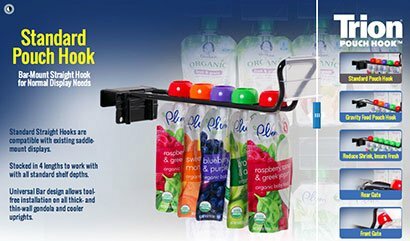 See the Trion Pouch Hook developed specifically for the Trion WonderBar, Bar Merchandising system in action. Trion adapted the highly successful Pouch Hook for use in Pegboard and stallwall applications. See it in action. Proprietary Rear Gate gate keeps product from being jostled off rear. Loads from rear, or easily dismounts to insure fast restocking, product rotation and reduced shrinkage. Product Rotates Loads from rear, or easily dismounts to insure fast restocking, product rotation and reduced shrinkage. 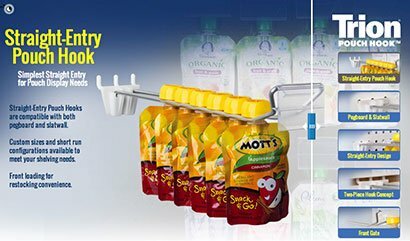 Flip-front Label Holder swings up for easy access and product removal. Front Gate Flip-front Label Holder swings up for easy access and product removal. Gravity-Feed configurations available to keep items forwarded and automatically faced. Gravity Feed Gravity-Feed configurations available to keep items forwarded and automatically faced.